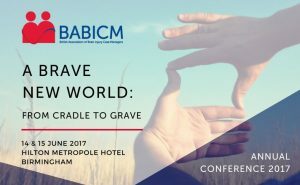 There is a week remaining until the BABICM annual conference, titled A Brave New World: From Cradle to Grave. It looks set to be an exciting event, with eminent speakers including Christine Croisiaux, Sue Lukersmith, Rebecca Johnson and Dr Howard Fine. Day 1 focuses on children and young people, whilst the second day focuses solely on adults. As the current chair of BABICM, our Managing Director Angela Kerr is going to be hosting both days of the conference. Our Case Managers Mairi, Jo and Emma are attending the second day as delegates. If you are attending and would like a chat with them in the networking breaks regarding our services, please email beth@akacasemanagement.co.uk with your preferred time. The conference is taking place at the Hilton Metropole Hotel in Birmingham. There is still time to book a place- don’t miss out! For the full programme and the chance to book, please visit the BABICM website.